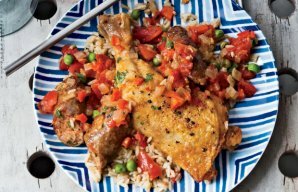 Serve these amazing Portuguese chicken dreams (sonhos de frango) with white rice and a tomato salad. Begin by cooking the chicken breasts and the potatoes in water seasoned with salt and a strand of olive oil. Remove from the water once it's cooked and drain well. Shred the chicken, mash the potatoes with the help of a fork, put everything in a bowl and set aside. Chop the onion, garlic, leek and parsley and add to the chicken and potatoes mixture. Add the eggs, the breadcrumbs and salt and pepper to taste. Mix everything very well with the help of a spoon. Form small balls with your hands and set aside. Heat a deep fryer with at least 2 or 3 fingers of oil. 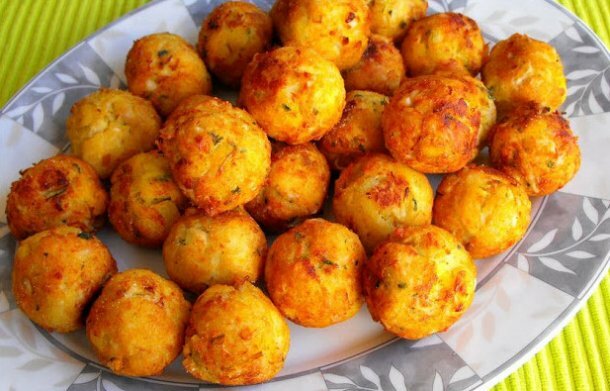 When the oil is hot, fry the chicken balls until they are golden brown. Remove and place on absorbent paper and repeat until all are done. Serve with white rice and a tomato salad. This Portuguese chicken and rice with chouriço (frango com arroz e chouriço) recipe makes a complete delicious meal. 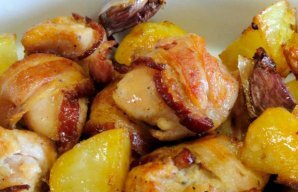 Serve this delicious Portuguese roasted chicken with bacon and beer (frango assado com bacon e cerveja) with white rice and/or a salad. 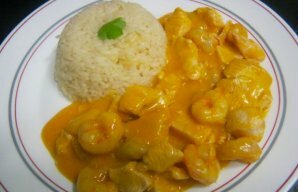 An easy to make Portuguese creamy chicken with shrimp recipe that is very tasty, serve with rice.